There is a direct relation with the growing market of products and ever-increasing number of consumers. To make an estimate of the actual demand of the market and to understand the relation between consumers and manufacturers, it is important to explore diversified dimensions of different markets. 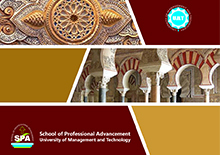 The participants enrolled in the Master of Marketing Management program are geared for this purpose. Successful graduates of this program can be an inspirational source of change and success for marketing and advertising as they gain a sound grasp of the principles of marketing and consumer behavior. Master of Marketing Management is a complete program structured to thrash all areas required for the vivid conception of marketing and advertising which are core areas of business. At SPA, the detailed aspects of business studies with the core subjects of marketing and advertising procures a team of highly skilled people aware of even the minute details of marketing and capable of launching modern techniques with frequent use of new concepts and technology. The progressive approach of SPA sets a solid platform for the participants to become independent learners by recurrent analysis of marketing, advertising and promotion. Therefore, graduates of the program find themselves at ease as exposure about the practical situations in the different fields of marketing makes them willing to accept challenges with eager anticipation. The use of modern technology and teaching aids nurtures talent and trains participants by developing insight that turns tough trials of reality into a pleasant learning experience. Formulating a marketing plan including marketing objectives, marketing mix, strategies, budgetary considerations, and evaluation criteria. Developing pricing strategies which take into account perceived value, competitive pressures, and corporate objectives. Determining strategies for developing new products and services that are consistent with evolving market needs. Communicating marketing information persuasively and accurately in oral, written, and graphic formats. Evaluating the viability of marketing a product or service in an international market or markets. Developing strategies to establish working relationships with clients, customers, and consumers which maintain and strengthen their loyalty to the organization. Graduates of the program will find prominent roles in different institutions that are directly or indirectly attached with aspects of sales and marketing. This program is specifically tailored for business sectors that rely heavily on sales and marketing strategies and equips them for evolving the best sales and marketing teams in view of financial dynamics and challenges. The successful completion of this program would lead participants to dynamic careers in the public and private sector as brand managers/executives, marketing managers, sales managers, and executives in financial institutions and limited companies. 14 Years qualification with 45% marks in case of annual system in the degree awarding institution. 14 Years qualification with 2.0/4.0 CGPA in case of semester system in the degree awarding institution. In case of an equivalent foreign qualification, an equivalent certificate from Higher Education Commission is mandatory. In case the foreign degree/transcript is in any language other than English or Urdu, an officially translated copy of the degree/transcript is mandatory. An officially translated copy is the one verified by the degree awarding institution, respective foreign ministry or an authorized public notary.